Designed with HPL and a tempered glass exterior. Frameless door has a lock installed. Features 3 prewired halogen spotlights. Elongated Hexagonal Freedom Tower measures 75" high overall x 36" wide x 20" deep. 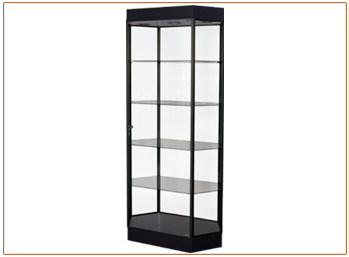 Specifications: 4" high crown, 67" high glass display, 4" high base.